QUIET "INSIDE" IS AS IMPORTANT AS QUIET "OUTSIDE"
A growing segment of J R Engineering's (JRE) business is consultation and recommendations as to how aircraft noise can be reduced in order to ensure a more pleasant interior environment. An aircraft in flight is surrounded by high intensity noise caused by its engines and the turbulent air passing over its skin. Noisy pumps and ventilation systems within the fuselage also contribute to the problem. The structure itself provides a multiple and complex assortment of possible sources and paths along which noise can travel and enter the cabin, thus effecting the comfort of the passengers. John Alberti preparing to test the interior noise levels on a custom 757. In commercial airliners, the problem is only addressed sufficiently to avoid major passenger and crew discomfort. 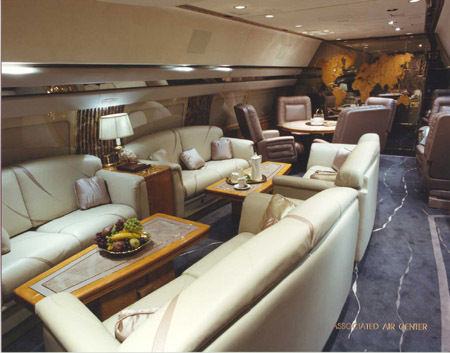 The problem is far more intrusive and unacceptable when it affects the comfort and elegance in a private or corporate aircraft interior - from a helicopter to a jumbo jet - used for business or entertainment. Finding and attenuating those sources and paths without adding excessive additional weight, or otherwise compromising the design, is a specialized branch of the art of noise control. Some of the world's finest custom aircraft interiors have benefited impressively from J R Engineering's expertise in this important area. JRE has worked with Associated Air Center of Dallas, TX on two custom 757-200's and consulted on several others. JRE was also able to significantly improve upon the noise treatment in an executive 727-100 with another company. One of the custom interiors crafted by Associated Air Center of Dallas, Texas.